Fiction – paperback; Bloomsbury Publishing; 288 pages; 2002. The prospect of reading Nobel Prize winning author Nadine Gordimer used to make me tremble in my boots. But earlier this year I read July’s People and found her style and her subject matter refreshing. I was keen to try more of her work, and when Kinga recently mentioned The Pickup in her Triple Choice Tuesday selection I decided to give this one a whirl. The dictionary defines “pickup” as: “an instance of approaching someone and engaging in romantic flirtation and courting with the intent to pursue romance, a date, or a sexual encounter”. In this novel, which begins in South Africa, it’s not really clear who’s picking up who, when Julie, a white woman from a privileged background, starts going out with Abdu, the mechanic who fixes her car. The relationship seems destined to be short-lived because Abdu, who is from an unnamed Middle Eastern country, is an illegal immigrant. But Julie, a PR professional, couldn’t care less about the stigma attached to this new relationship, because she’s determined to carve her own way in life, free from her overbearing father’s money, his expectations and his much younger second wife. The authorities eventually catch up with Abdu. As his deportation looms, Julie makes a surprising decision: she will marry him and move to his home country that he hates so much. The bulk of the book is therefore set in an unspecified Islamic country, where poverty is the natural order and the family is the glue which holds society together. To Julie, an only child who’s survived her parent’s divorce, living with a rather large and extended family is not the claustrophobic experience one might expect. She treats this new life as an adventure and adapts surprisingly well. But all the while Abdu is applying for legal asylum in other countries in the hope to provide them both with a better life. As one by one, his applications are turned down, Abdu’s resentment, frustration and anger builds. Will their relationship stand the strain? Will Julie abandon him and run back to South Africa? Or will Abdu come to terms with the good things in his life rather than searching for something he cannot have? The Pickup is one of those books that is rich with meaning and motifs, exploring as it does the notion of race, culture and identity. It also examines the divide between East and West, rich and poor, the freedom of movement versus immigration controls. But in Gordimer’s hands these universal issues are handled in an understated way. She merely plants the seeds and it’s you, the reader, who joins the dots and mulls things over and wonders how on earth she has said so much using so few words! But this is a demanding read, one that requires plenty of space and time to digest properly. Gordimer’s sentence structure is diametrically opposed to the normal rigours of Plain English and takes some time to get used to. This is not a criticism. Indeed, I like that a writer can use the language in such a way that it forces me to change my reading habits: instead of racing through the text, eager to find out what happens next, I took my time and lingered over each sentence, absorbing each one slowly but surely, before moving onto the next one. 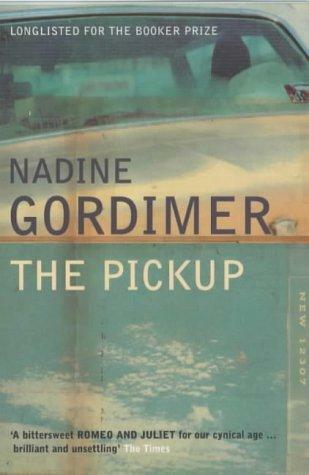 There’s no doubt that The Pickup is hard work, but I so enjoyed the story and the issues it throws up it has only made me more determined to explore more of Gordimer’s extensive back catalogue. Suggestions for other titles to try are more than welcome. It seems as if Nadine Gordimer’s writing does tend to be a bit hard work but interesting and rewarding. I can’t say that I would jump at the chance to read Gordimer again after July’s People but I do think I would pick something by her for a book group because that situation provides the opportunity for exploring / revealing aspects of a book I might miss on my own. I like the sound of this and too wouldnt mind picking up (do you see what I did there?) this book at some point as I am keen to read more of Gordimers work from reading July’s People. I do think though I would work well for me in a book group because, for me at least, she is an author who you want to discuss the books of as there are so many things she implies and almost says amongst the rather crazy and creative way she contructs her narrative. This one would certainly make a great book group book as there are so many issues to discuss, not least her odd writing style. For instance, would you give up a life of privilege and a career to go live in the desert where women are second-class citizens? Would you throw away all your prospects to live with the person you love? Shes hard work but worth it, I think. I sometimes get a bit jaded in my reading so its always nice to read something by an author that comes at things from a totally different aspect/perspective. I’m really pleased you liked it. It’s always a bit nervy recommending books to people, never quite knowing what they’ll think. I would really like to read more Gordimer, too. I found The Pickup easier to get into than July’s People but I wonder if all her other books are written in a similar style.